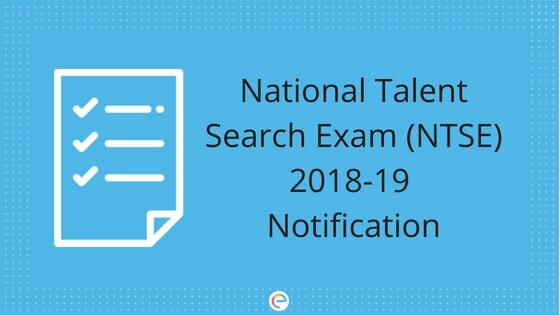 NTSE Notification 2018-19: The National Talent Search Examination, popularly known as NTSE, is one of the most competitive and prestigious scholarship programs in India. It is conducted every year for the students of Class 10. The exam is conducted by the National Council of Educational Research and Training (NCERT). The selected candidates are provided with monetary benefits all through their academic life. Also, NTSE scholars get several other benefits all through life. NTSE aspirants who want to appear in NTSE 2018-19 must have a clear knowledge of the NTSE Notification 2018. This will help them plan their NTSE 2018 preparation better. Also, you must have a clear knowledge of the NTSE eligibility criteria, how to apply for NTSE, important dates for the exam, etc. In this article on NTSE Notification 2018-19, we will provide you with all these information. Read on to find out. Language of Exam For Stage 1, the medium will be decided by the respective States/Union Territories. For Stage 2, Asamiya, Bangla, English, Gujarati, Hindi, Kannada, Marathi, Malayalam, Odia, Punjabi, Tamil, Telugu and Urdu. 1. Students studying in Class 10 in any recognized school, including students under Open & Distance Learning are eligible to appear in the Stage 1 of NTSE exam. 2. Selected students from the NTSE Stage 1 exam (State-level) are eligible to appear for the Stage 2 of NTSE. 3. Students of Indian nationality studying abroad can appear for NTSE Stage 2 directly. But they must have secured 60 percent marks in the last annual examination conducted by the school. Aspiring candidates must keep an eye on newspapers for NTSE advertisement. You can also bookmark this page and check it from time to time. All the news about NTSE 2018-19 will be updated here. Submit your NTSE application form to the State Liaison Officer. The NTSE application fee and mode of payment will be decided and announced by the respective States and Union Territories. There is no fee necessary for the Stage 2 of the exam. Each question will carry 1 mark. There is no negative marking in NTSE. Each State/Union Territory releases a merit list of their own for the Stage 1 of NTSE based on the performance of the candidates. Usually, the qualifying marks for General category students for each of the papers (MAT and SAT) is 40 percent. The NTSE Stage 1 result is declared usually in the month of January-February. The selected candidates are eligible to appear for NTSE Stage 2 conducted usually in the month of May. Based on the performance of the students, 1000 students are selected for scholarship. Apart from this, being an NTSE scholar has many other benefits and perks. Now that you know everything about NTSE Notification 2019, start your preparation as early as possible. With just a few months left for the exam, you shouldn’t waste your time at all. You need to finish the whole NTSE syllabus before time, practice sufficient practice questions, and take mock tests. You also need to work on your speed and accuracy. At Embibe, we provide free NTSE practice questions and NTSE mock tests which will be of great help to you in your NTSE preparation. We hope this detailed article on NTSE Notification helps you. If you have any query regarding NTSE 2019 Notification or the exam in general, feel free to ping us. We will get back to you.